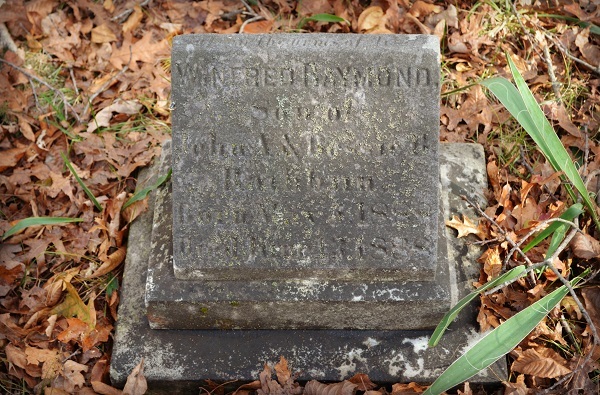 According to Audrey Mae’s artistically designed cemetery map and Audrey Mae’s gravestone numbering system in her Spencer Family Cemetery, Wilfred Raymond Rathbun’s gravestone is Gravestone Number Sixty-Three. Using her Smith-Corona typewriter in the late 1980s, Audrey Mae typed the following mini-biography of Wilfred Raymond Rathbun, an eighth-generation Spencer in East Greenwich, Rhode Island. Wilfred died as a one month old infant. According to Audrey Mae, Wilfred’s father was John Augustus Rathbun and his mother was Bessie B. (Dawley) Rathbun. Web site author is uncertain what Audrey Mae meant by John (gravestone No. 58) and Evelyn (gravestone No.57) as parents. Were they parents of Wilfred Raymond? However, John, Evelyn and Wilfred Raymond are in the same generation according to Audrey Mae, so they could not be parents and child in the same generation. More research needed. Perhaps, John Augustus Rathbun and Bessie Dawley (Yuccas) Rathbun are the parents of Wilfred (gravestone No. 63) and John Rathbun (gravestone No. 58). This entry was posted in All Gravestones, Undetermined on December 18, 2012 by Heather.